This article is about Pokémon Trainer's appearance in Super Smash Bros. Ultimate. For the character in other contexts, see Pokémon Trainer. 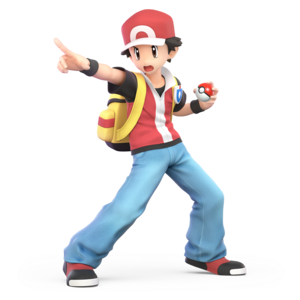 Pokémon Trainer (ポケモントレーナー, Pokémon Trainer) is a playable character in Super Smash Bros. Ultimate, confirmed on June 12th, 2018. 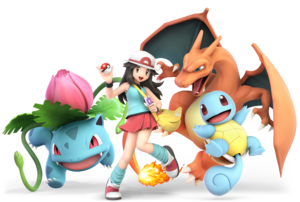 Pokémon Trainer can use three interchangeable Pokémon in battle: Squirtle, Ivysaur, and Charizard. Pokémon Trainer, unlike most characters, was not given a fighter number; instead, the Pokémon are given numbers. Squirtle is classified as fighter #33, Ivysaur is classified as fighter #34, and Charizard is classified as fighter #35. In English, Billy Bob Thompson and Kate Bristol voice the male and female Pokémon Trainers, respectively, the former replacing Michele Knotz from Brawl. In Japanese, they are voiced by Tomoe Hanba and Wakana Kingyo, respectively, with the former reprising her role as the male Pokémon Trainer from Brawl. Play VS. matches, with the Pokémon Trainer being the 26th character to be unlocked. Clear Classic Mode with Donkey Kong or anyone in his unlock tree, being the second character unlocked after Bowser. Have the Pokémon Trainer join the player's party in World of Light. With the exception of the third method, the Pokémon Trainer must then be defeated on Pokémon Stadium. The list below covers the general changes of the Pokémon Trainer as a whole. For information about each individual Pokémon's moveset changes, see Squirtle (SSBU), Ivysaur (SSBU), and Charizard (SSBU). Pokémon Trainer has been heavily buffed in the transition from Brawl. Notably, both the Stamina mechanic and type effectiveness have been completely removed, and Pokémon Change has been granted high utility due to the addition of aerial switching and significantly faster Pokémon switches. As such, switches between the three Pokémon have now become a unique advantage for the Pokémon Trainer alone rather than being a major mandatory commitment, and the Pokémon are now free to fight indefinitely without being limited by Stamina during battle. In addition, Ivysaur, who was previously the worst Pokémon in the party, has been greatly buffed, and the general changes to Ultimate's mechanics greatly benefit Ivysaur and Squirtle. Each of the Trainer's Pokémon is usable as its own character, but as in Brawl, usage of all three for different situations is optimal. Despite some noteworthy buffs, Pokémon Trainer has also received some nerfs. While the removal of type effectiveness slightly benefits Charizard and greatly benefits Ivysaur, it also greatly hinders Squirtle. Additionally, while Pokémon Change has been greatly improved, it has also received a few new disadvantages as there is now a timer which prevents switching for a couple of seconds (although there are ways to work around this) and it no longer resets stale move negation, effectively weakening the next Pokémon. Squirtle has also been considerably nerfed, and Ivysaur and Charizard have received some nerfs as well. Nevertheless, Pokémon Trainer is a significantly more effective character than in Brawl. Despite still having an extremely high learning curve, Pokémon Trainer has a notable playerbase, especially compared to Brawl. However, while being considered a very effective character, Pokémon Trainer is nonetheless considered to fall short compared to characters that have more strengths such as Peach and Lucina. The male Pokémon Trainer's model is significantly more detailed than it was in Brawl, having stylised body proportions and sharper, slimmer eyes. Additionally, the Trainer's Poké Balls have been resized to fit in his palm. Both of these changes make his design similar to the style of recent Pokémon titles. The female Pokémon Trainer from FireRed and LeafGreen appears as half of Pokémon Trainer's alternate costumes. In addition to distinct voice clips, the majority of her animations are unique. The Pokémon Trainer now turns in battle to face the position of the Pokémon. Triple Finish has a different text box and animations; the text box is now identical to how they appear in the Generation VII games. The Pokémon Trainer now says "All right!" when performing an up taunt and "Yeah!" when performing a down taunt. On the results screen, the Pokémon Trainer is shown and announced as the winner of the fight rather than the Pokémon that was in battle. The Trainer’s face is also used as the stock icon for all three Pokémon, although the Pokémon also have their own stock icons used for other modes. The Trainer now claps on the results screen, instead of looking down in disappointment like in Brawl. Pokémon Trainer's crowd cheer is now "I choose you!" Both genders of the Pokémon Trainer have unique reactions to the situation of their Pokémon, such as when it lands a hit, takes a hit, scores a KO or is KO'd. The Stamina mechanic has been removed, eliminating the need to switch out Pokémon to restore their power. Type effectiveness has been removed. This greatly benefits Ivysaur and slightly benefits Charizard, but it also greatly hinders Squirtle. Squirtle is now selected as the starting Pokémon by default when the player chooses Pokémon Trainer on the character select screen. This selection can still be changed before starting the match. In Brawl, a random starting Pokémon would be chosen by default if the player did not choose a Pokémon on the character select. If an amiibo of the Pokémon Trainer's Pokémon is used, it will be the default starting Pokémon. Pokémon Change is much faster due to no longer having to load the next Pokémon during every switch, and it can now be used in the air. Like in Brawl, it also offers brief invincibility upon switching out, though the quicker switch time allows it to potentially combo into another Pokémon's moves, or function somewhat as an alternative dodge. It also allows the user to choose the recovery that suits a situation best, and it can now be used during the invulnerability period after re-spawning. As a result, switching is far less committal than in was in Brawl, making it a very strong option overall. Spamming Pokémon Change will grant no invincibility frames for a period of time, and has a cooldown of around 2 seconds. This cooldown can be skipped if a special move is used. Additionally, Pokémon Change no longer resets stale move negation, and if it is performed off the edge of a moving platform, it will no longer skip the ending lag of the switch (although Squirtle and Ivysaur will still gain an extra mid-air jump if the technique is performed). Triple Finish has overall less damage potential (58% → 44.3%). Fixed an issue where last stock final KO from Diddy Kong’s Monkey Flip would cancel knockback by mashing down special. The Ditto glitch which allowed the Pokémon Trainer to enter on stage in Training Mode has been fixed. Pokémon Trainer is a three-in-one character who battles using his three Pokémon: Squirtle, Ivysaur and Charizard. As the fourth and "main" entity of the character group, the Trainer stays in the background and does not participate in battle. Only one Pokémon is active at once, and all three of them have different movesets and abilities. It is possible to change which Pokémon the Pokémon Trainer starts with at the beginning of a match. On the character select screen, Pokémon Trainer has the starting Pokémon's portrait to the upper-right of the portrait. If the Y button is pressed, or if the Pokémon's portrait is hovered over and selected, the starting Pokémon is toggled to the next one. The default starting Pokémon is Squirtle, which can be toggled to Ivysaur, then Charizard, then back to Squirtle. The three Pokémon have separate movesets and attributes. The only moves shared by the Pokémon are their down special move, Pokémon Change, and their Final Smash, Triple Finish. Pokémon Change involves the Pokémon Trainer recalling the currently active Pokémon and sending out the next one to replace it. The order that the Pokémon are changed in is the same as toggling on the character select screen: Squirtle changes to Ivysaur, Ivysaur to Charizard, and Charizard to Squirtle. Triple Finish is a combination attack for which the Pokémon Trainer temporarily brings out all three Pokémon to attack simultaneously. The attack covers a large range and deals repeated damage to opponents caught in it. Once the move is over, the two inactive Pokémon are recalled. While not directly controllable, the Pokémon Trainer can be seen standing in the background of the stage, commanding his Pokémon and reacting to the Pokémon's situation. There are various animations and voice lines which differ for the male and female Pokémon Trainers. The Pokémon Trainer is able to move around somewhat on most stages, running toward the current Pokémon if it is far enough away, and will also turn to face the position of the Pokémon at most times. On some stages, the Pokémon Trainer stands on a special platform in the background rather than standing on a part of the stage's background. On these stages, the Pokémon Trainer can not move around but will still turn to face the Pokémon. Pokémon Trainer does not appear in the background during battles with five or more players or in Squad Strike's Tag Team mode, but can still be heard shouting commands. The Poké Ball and its energy effects can be seen travelling towards the foreground, implying that the Pokémon Trainer is in the foreground, outside of the camera's view. This also happens in certain single-player and co-op modes. Neutral special move: Points left or right, based on the direction the Pokémon is facing. Side special move: Points left or right, based on the direction the move was used in. Up special move: Points towards the direction the Pokémon is facing, or upwards if the Pokémon is above. When using the Pokémon’s down special move, Pokémon Change, the Pokémon Trainer throws the next Pokémon's Poké Ball toward the Pokémon's position, then holds up the previous Pokémon's Poké Ball as it is recalled in energy form. The Pokémon Trainer then puts the Poké Ball away in his bag and pulls out the new next Pokémon's Poké Ball. The Pokémon Trainer also says a voice line, either encouraging the next Pokémon or praising the previous Pokémon. Pokémon Change cannot be used again until this animation completes or is interrupted by using another special move. When using the Final Smash, Triple Finish, the Pokémon Trainer throws the other two Pokémon's Poké Balls out and points toward the direction the move was used in for the duration of the attack, while saying a voice line including the name of the move. Once the attack is over, the Pokémon Trainer recalls the other two Pokémon and puts a Poké Ball away in his bag. Pokémon Change cannot be used until this animation completes or is interrupted by using another special move. When the active Pokémon lands a hit, the Pokémon Trainer does a small fist pump with a happy expression. The male Trainer raises his left fist and fist pumps, while nodding and winking, with a happy expression. The female Trainer jumps into the air with her right arm raised, doing a full spin mid-jump, and does a double fist pump as she lands. The male Trainer throws his left fist downwards with a distressed expression. The female Trainer winces with a distressed expression. The male Trainer shakes his head while covering his face with his left hand. He may say "Agh!" or "Dang it!" The female Trainer shakes her head while covering her face with her left hand. She may say "Ahh!" or "Dang it!" The male Trainer puts his left hand on the back of his head and looks downward with a distressed expression. He will say one of three lines: the Pokémon's name in a distressed tone, "Wake up!" or "Get a hold of yourself!" The female Trainer puts her left hand on the side of her head and looks downward with a distressed expression. She will say one of three lines: the Pokémon's name in a distressed tone, "Wake up!" or "You've got this!" Pokémon Trainer sends out the starting Pokémon from its Poké Ball while saying "Go!" or the Pokémon's name. Up taunt: Triumphantly raises his right hand into the air, saying "All right!" Side taunt: Fist pumps with his left hand. Down taunt: Fist pumps with his left hand while posing triumphantly, saying "Yeah!" Up taunt: Fist pumps with her left hand while triumphantly raising her right hand into the air, saying "All right!" Side taunt: Fist pumps with her left hand. Down taunt: Jumps slightly off the ground while doing a double fist pump, saying "Yeah!" Rubs his left leg with his left hand. Jumps gently on the spot twice. Wipes her brow with her left hand. Stretches her right arm, holding her elbow with her left hand. During all of Pokémon Trainer's victory poses, the Trainer will either say a non-specific line, or a line specific to the active Pokémon. The male Trainer can say "You all did great!" (みんな、よくがんばったな！, Everyone, you did great! ), while the female Trainer can say "Everyone did great!" (みんな、最高だね！, Everyone, you're the best!). Regardless of the Pokémon that was out, the Trainer will perform the same general action for each Pokémon's victory pose. While the Pokémon is doing something else, the Trainer throws a Poké Ball up, catches it, and holds it out in front of them. The Pokémon does one of its moves, and the Trainer cheers it on before raising an arm in the air. The Trainer pets the Pokémon. A small excerpt of the title theme of Pokémon Red, Blue, Yellow, and Green Versions, a track which would go on to become the Pokémon main theme and the title theme for the entire series. During Squirtle's victory poses, the Pokémon Trainer might say "Good job, Squirtle!" (よくやったな、ゼニガメ！), while the female Trainer can say "We did it, Squirtle!" (やったね、ゼニガメ！). Jumps and spins around on its shell in a breakdance move, and then lands and poses. Spits water quickly in three directions, does a backflip, then poses with its arm in the air. The Pokémon Trainer holds Squirtle in his arms, then kneels down and puts it on the ground, and rubs its chin and head. During Ivysaur's victory poses, both Trainers can say "Way to go, Ivysaur!" In Japanese, the male Trainer says がんばったな、フシギソウ！, while the female Trainer says がんばったね、フシギソウ！, both of which translate to "You did great, Ivysaur!" Runs forward, does a backflip, then strikes a pose. Whips two vines forward, then poses with its vines extended. The Pokémon Trainer pets Ivysaur, and it jumps onto the trainer’s arms, then puts it back down and continues to pet it. During Charizard's victory poses, the Pokémon Trainer might say "You did it, Charizard!" (やったぞ、リザードン！, You did it, Charizard! ), while the female Trainer can say "You're amazing, Charizard!" (すごいね、リザードン！, Amazing, Charizard!). Stomps and rears its head back to roar upward, then strikes a pose. Uses Flare Blitz downwards to descend from the sky and crash into the ground, bounces out of it and lands on its feet, then strikes a pose. The Pokémon Trainer pets its head and neck. Diablo – Placed 65th at GENESIS 6, beating Ned. Ned – Placed 1st at NEW GAME PLUS: The ULTIMATE Overnight Experience, 3rd at Retro Arena 64, and 9th at Midwest Mayhem Ultimate with Pokémon Trainer as one of his characters. Pandarian – Placed 7th at Ultimate Nimbus and 5th at Battle of BC 3, beating Eon. Wishes – Placed 9th at Frostbite 2019, Collision 2019, and 3rd at Suplex City Smash beating Samsora, Fatality, Tea, and Light. Leffen – Placed 7th at Valhalla II and 17th at GENESIS 6 with wins over WaDi and Seagull Joe and a close set with Glutonny. He had since dropped Pokémon Trainer for Roy. Pokémon Trainer's route refers to the player's goal of becoming the Pokémon Champion in the Pokémon games. Like in Pikachu's route, the opponents are all Pokémon. Each round will start with the Pokémon chosen on the character select screen regardless of which one was active at the end of the previous round. 6 Opposite-gender Pokémon Trainer Pokémon Stadium 2 The Battle at the Summit! The male Pokémon Trainer was among the fighters summoned to fight the army of Master Hands. During the opening cutscene, the Pokémon Trainer was present on the cliffside when Galeem unleashed its beams of light. Working together with Bowser and his Fire Breath, he sent out Squirtle, Ivysaur, and Charizard in an attempt to fight back against the beams with Triple Finish, to no avail. All four were vaporized and placed under Galeem's imprisonment along with the rest of the fighters (excluding Kirby). The male Pokémon Trainer can be found at the southeast near the maze that resembles Pac-Maze. Defeating him also allows access to all of his Pokémon. While Squirtle, Ivysaur, and Charizard’s Fighter Spirits are obtained by completing Classic Mode as Pokemon Trainer, the Spirits for the Trainers themselves are only available periodically for purchase in the shop for 500 coins. Unlocking Pokémon Trainer in World of Light allows the player to preview the first spirit below in the Spirit List under the name "???". As Fighter Spirits, they cannot be used in Spirit Battles and are purely aesthetic. Unlike most fighters, the Spirits for Pokémon Trainer only use their artwork from Ultimate, rather than also having alternative artwork from a previous appearance. Only the starting Pokémon is shown on the character selection screen; it can be changed by pressing Y or by hovering the cursor over it and selecting it. Each of Pokémon Trainer's alternate costumes references a protagonist from each generation of the Pokémon games. Artwork of all playable Pokémon characters and Poké Ball Pokémon, as posted by the official Pokémon Twitter account. Charizard using Flare Blitz on Prism Tower. Ivysaur taunting on Gaur Plain. The Pokémon trio running from a Burrowing Snagret on The Great Cave Offensive. Squirtle, Ivysaur, and Charizard on Skyworld. The female Trainer throwing a Poké Ball on Prism Tower. Squirtle attacking Inkling with Water Gun on Pokémon Stadium 2. Squirtle getting splashed by Isabelle on Delfino Plaza. Squirtle struck by Lucario on the Bridge of Eldin. Charizard with Lucina on Skyworld. Ivysaur attacking a Leaf Shielding Mega Man with its dash attack on Tortimer Island. Female Pokémon Trainer with a taunting female Pikachu on Battlefield. Squirtle, Ivysaur and a giant golden Pikachu on Pokémon Stadium 2. Ivysaur taunting with Sheik on Tomodachi Life. Ivysaur taunting with Villager on 3D Land. Pokémon Trainer is the first composite character to have been separated in a sequel and later reformed back into a composite character. As previous "dual character" pairings have been removed (Zelda and Sheik in Melee and Brawl, and Samus and Zero Suit Samus in Brawl), Pokémon Trainer's ability to switch characters has now become a unique character attribute. Each of the three Pokémon appear as solo CPU characters during Classic Mode, World of Light, and Spirit battles without the presence of Pokémon Trainer. They also use individual stock icons. In World of Light, if the player selects Pokémon Trainer as well as the individual Pokémon to start with, its stock icon is used on the battle preview screen as well. This makes Pokémon Trainer one of two characters where only the original fighter is fought at any point of the mode outside of facing Galeem's and Dharkon's puppet fighters (the other being the Cloud). This also makes the Pokémon Trainer the least recurring character in the World of Light, only ever to be encountered once, since neither gender has a false counterpart whatsoever, unlike Cloud with Dharkon. Oddly enough, the Army of Puppets cutscene has a visible false version of the male Pokémon Trainer among a crowd of other puppet fighters, making his lack of presence during Spirit battles more unclear. Pokémon Trainer is the only playable character to not have a fighter number. Squirtle, Ivysaur, and Charizard are each numbered from 33 to 35 instead. The male Pokémon Trainer shares his English voice actor, Billy Thompson, with another playable Pokémon character, Greninja. Thompson has confirmed this in a Tweet where he jokingly asserted that the Pokémon Trainer's name is Momo. The official render of the female Pokémon Trainer uses her Pokémon's default colors; however, in the game, they use an alternate color scheme. Ironically, her Pokémon use a red color scheme (albeit on parts of the Pokémon that already appear reddish), whereas Green in the Pokémon series is associated with the colors green and blue (depending on the region). The Trainer's Pokémon do not appear on the victory screen if there are three or more players on the winning team. Despite this, Ivysaur can still be heard whenever it's the fighter with the highest score/stock count at the end of a match. They also do not appear in the "No Contest" screen. When freeing Pokémon Trainer from Galeem, the male Trainer's eyes will be normal in-battle despite his pre-battle render having the red eye glow that other World of Light spirit fights have. His Pokémon will have possessed red eyes, however. Prior to launch, there was a glitch where Pokémon Trainer could win a time match regardless of the score. This would only occur when Sudden Death was supposed to happen. It is not clear whether this has since been patched out or not. Pokémon Trainer is one of two characters to have different animations for each gender of their alternate costumes, the other being Inkling. Pokémon Trainer's gender-unique animations apply only to the Trainers themselves, not their Pokémon. Pokémon Trainer can be directly controlled by the player, in a sense; in World of Light, the Trainer can be moved around the world map, in a coincidental parallel to the Pokémon games where the Trainer is used to navigate the world while the Pokémon are controlled in battle. However, during the Classic Mode credits minigame as well as when freeing a spirit from the Spirit Board, the selected default Pokémon is used with the Trainer being absent; this is likely due to the trainer themselves having no animations for using items like their Pokémon. Despite having created at least one possessed version along with the other possessed fighters, it is impossible to fight against a possessed version of the Pokémon Trainer in World of Light outside of their Fighter Battle as they do not appear alongside the possessed versions of their Pokémon for any of the Spirit Battles. In Spanish, German, French, and Italian, the voice clip from the announcer on the victory screen is slightly different from the one used on the character select screen, instead featuring a noticeable translation of "the" (respectively, "el Entrenador Pokémon"/"la Entrenadora Pokémon", "der Pokémon-Trainer"/"die Pokémon-Trainerin", "le Dresseur de Pokémon"/"la Dresseuse de Pokémon", and "il Allenatore di Pokémon"/"la Allenatrice di Pokémon"). The fighter shares this trait with Wii Fit Trainer, Inkling, Villager, and the Mii Fighters. 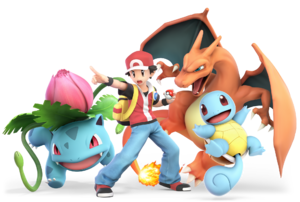 Pokémon Trainer is represented through four separate amiibo: the male Trainer, Squirtle, Ivysaur, and the Charizard from the SSB4 line. This makes the Trainer the only character in the Smash series to be summonable via multiple Smash series amiibo depicting different characters. There is a glitch with the Pokémon Trainer involving the Final Smash Meter. If an enemy uses their metered Final Smash shortly before or after Pokémon Trainer gets theirs (if it’s before then the meter must fill during the Final Smash), whichever Pokémon is currently in play will no longer have the glow indicating that they have their Final Smash, though their eyes will still be yellow. Pokémon Trainer is the first character to have multiple characters in its slot, but to not have an announcer clip for all of the characters. In Brawl, this was the case, with the announcer clip changing depending on the selected Pokémon (with the default Pokémon Trainer selection resulting in a random Pokémon being sent out), but this was changed in Ultimate. Curiously, the pronunciation of the Pokémon Trainer's clip was different in the Japanese version of Brawl, but remains the same in Japanese and English in Ultimate. This is likely because the pronunciation of "Pokémon" has been standardized between languages since Brawl. This page was last edited on April 22, 2019, at 16:51.